Christina writes: The letters that Tolkien wrote to his children as if from Father Christmas and his helpers are one of his most elaborate productions, and have a very complex publishing history. Unlike single works like The Hobbit and The Lord of the Rings, the ‘Father Christmas’ letters are a series in which each letter is an independent text, and every sheet, envelope, and picture significant as a work of art; and yet, the letters also have meaning as a collective unit, as Tolkien developed the fiction of ‘Father Christmas’ year by year, sometimes referring back to earlier events. Our appreciation of the letters, as texts or artefacts, has been affected, however, by editorial choices: to publish only some of the letters, or parts of letters; to transcribe a letter in its entirety or only in part; to accompany a reproduction of idiosyncratic handwriting with a transcription, or to replace it; to reproduce a letter, envelope, or picture as a whole or to divide it into graphic elements. And these considerations have varied from edition to edition. A selection of the material was first published in 1976 in the U.K. and the U.S. in large format hardback, with the title The Father Christmas Letters. It was edited by Baillie Tolkien, who comments in her introduction: ‘In this book it has been possible to give only a few examples of Father Christmas’ shaky handwriting, and of the decorations of the letters and the envelopes. But almost all the pictures that he sent are here reproduced. . . .’ Indeed, the 1976 edition, like subsequent paperback editions in the same format, concentrates on the pictures drawn or painted by Father Christmas, the North Polar Bear, and the elf Ilbereth; but not all of the pictures are reproduced complete or in one piece. Parts of the text of the letters are transcribed in print, while the volume also contains only token reproductions of the original, elaborately written and decorated letters and envelopes. The partial transcriptions used in 1976 set a precedent, followed in later editions, of expanding the original manuscript contractions such as ‘F.C.’ to ‘Father Christmas’ and ‘&’ to ‘and’. In his Tolkien Descriptive Bibliography (1993), Wayne needed to devote less than two and a half pages to the 1976 Father Christmas Letters, one of the simpler entries. At that date, the 1976 British and American hardbacks and their respective paperback versions (1978 and 1979) were the extent of the letters’ publication. Although we knew from Baillie’s introduction that more of the letters existed, we did not realize their full extent and complexity until 1993, when we began our research for J.R.R. Tolkien: Artist and Illustrator (1995) and were allowed to study the originals at Oxford. From these, we chose to include in Artist and Illustrator three previously unpublished items, an envelope, a page of a letter, and a picture, as well as reproduce complete three of the major pictures, the tiers of which previously had been scattered over several pages. 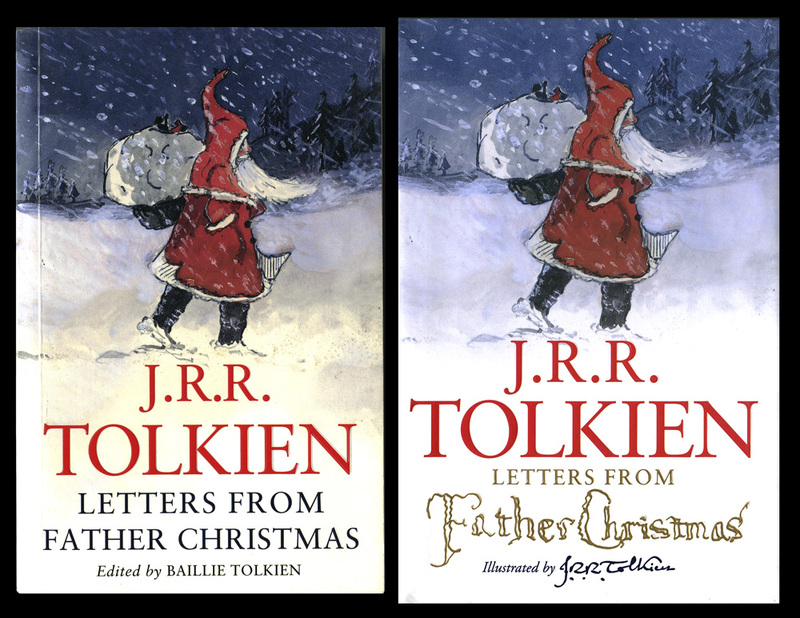 Further editions of the letters followed at intervals in both the U.K. and the U.S., all with the title Letters from Father Christmas, edited by Baillie Tolkien. The edition in three miniature (9.2 × 7.5 cm) volumes published in 1994, also published in one volume in 1998, offered nothing new; and of course, most of the images were much reduced. Another edition was published in 1995, at about the same time as Artist and Illustrator: this was an oblong hardback (16.5 × 21.8 cm) which contained ten facsimile pages of letters (sometimes with a sentence or two deleted) with transcriptions on the verso, or illustrations enclosed in facsimile envelopes, with illustrations and summaries of text on intervening pages. The facsimile envelopes, with dates removed and parts of the addresses covered by a panel with text, are not always matched with facsimiles of their original contents. The large (28.5 × 22.4 cm) Letters from Father Christmas published in 1999 with a mainly dark blue dust-jacket offers a more complete collection in terms of the number of illustrations of artefacts, including all of the pictures, but for some with less good colour reproduction (an orange tone), mainly in some previously unpublished letters and envelopes, and with distracting decoration of the pages with enlarged details from the letters and illustrations. This edition also provides a more or less complete transcription of all of the existing letters, as do the later editions. A revised version, with a mainly red dust-jacket or cover, was published in 2004, slightly smaller, with fewer pages and fewer illustrations, but also omitting some of the distracting details though not improving the colour reproduction. Some of the envelopes that no longer appear inside the book are reproduced on the lower cover of the dust-jacket of the U.K. hardback edition only, much reduced in size and with parts obscured. This was the situation when Wayne and I described the letters in our list of ‘Published Art by J.R.R. Tolkien’ in the Chronology volume of our J.R.R. Tolkien Companion and Guide, pp. 829–30. We noted at that time* that only the 1976 volume included part of the 1932 letter, and a few minor pieces (stamps, foliage decoration); and that three pictures, eight envelopes, and six pages of letters appeared for the first time in the 1995 edition, though alterations were made to the letters and envelopes and some parts of the envelopes were obscured. One of the envelopes and one of the pictures was also published, much larger, in Artist and Illustrator two weeks later (which should have appeared first, but publication was delayed). The same envelope and three of the pages of letters published 1995 are not included in the 1999 edition. In 2009, the situation became even more complex when HarperCollins (only) produced yet another edition of Letters from Father Christmas, this time as a trade paperback of moderate size (19.8 × 12.8 cm). I then made a detailed analysis of all of the editions and wrote an eleven-page article for Tolkien Collector 31, in which I recorded, year by year, the publishing history of each artefact in the series, noting what appeared in each edition and commenting on the size and quality of reproduction. I also quantified the transcribed text in each edition, noting some variations and, where comparison was possible, some instances where it differed from the original manuscript. Earlier this year, I noticed on Amazon that HarperCollins intended to publish yet another, hardback edition of Letters from Father Christmas in late September. Since the picture in the online description was very close to that of the 2009 edition, I wondered if it was a reprint of the trade paperback in hardback, but then I saw that it would have 192 pages, whereas the 2009 edition has 160. I also wondered then, and still do, if this new edition might have been inspired by my Tolkien Collector article. Our copy finally arrived a couple of weeks ago, and since then I have been comparing its contents with earlier editions preparatory to writing a detailed update for the next Tolkien Collector and an addendum for our website; but I thought a summary of the whole history would provide an interesting blog post. First and most important, the 2012 edition provides thirty-nine new images, all but a few of pages of letters, so that the reader can compare all of the originals with the transcriptions. Most of the reproductions in the new volume have been much improved compared with those of the 2009 volume (also 1999, 2004), which had an orange tone which swamped any colours Tolkien used. Some are probably still a little darker or warmer than the originals, certainly when one can compare with reproductions in pre-1999 editions, and a few seem to have became a little warmer (unfortunately including a couple of the pictures), and some of the new illustrations also have a warmish tone, though none so warm as to swamp Tolkien’s work. A few previously published items are not included in the 2012 volume. The three most significant of these are the 1924 envelope to John (published partially obscured in 1995, and complete in Artist and Illustrator); the verso of the dark 1927 envelope with worn white writing (published only in the 1999 edition); and a ?1932 rather plain envelope (published on p. 121 of the 1999 edition). Other omissions are versos of envelopes, one with a commercial Father Christmas seal (published in the 1995 and 1999 editions), and two others with red seals (published only in the 1999 edition). The transcriptions are basically the same as in the 1999 volume, with a few additions such as the text of a 1934 letter to Priscilla, one of those reproduced for the first time. There are also a few changes to the earlier text. In the Tolkien Collector I noted several variations and omissions in the transcriptions, and some of these have now been changed. The 1932 letter, for instance, correctly has ‘the ox, stag, boar, and cave-bear’ as appears in the illustration and in the 1976 edition, instead of ‘the ox, stag, bear and cave-bear’ in the editions of 1999 through 2006. But other, especially longer textual points have not changed. Some editing of the text is still evident, in cases of particularly family-centred writing, but seems curious when one can read the original in reproduction. As far as contents are concerned, the edition of 2012 is by far the most complete, and certainly supersedes that of 2009. The colour reproduction of many of the images is much better than in the 1999 edition, though a few are still not as bright as in the 1976 and 1995 editions. Because of the comparatively small format (roughly the same as the 2009 paperback), many of the images are necessarily much reduced relative to earlier editions, making reading the letters in the original less easy and obscuring detail in the pictures. In most cases, the larger pictures are brighter in the 1976 edition, but some of these (one each from 1926, 1931, 1932, and 1933) are not reproduced complete, but divided across several pages. For those (except 1926), the best images are in Artist and Illustrator. The orange tone in some of the images in the 1999, 2004, and 2009 volumes was confined to envelopes and letters and did not affect the pictures, though some of these seem a little dulled or darkened in reproduction, so maybe the best recommendation is for 2012 for completeness, but 1999 for the larger pictures and a few minor items not in 2012. But the Tolkien enthusiast will also need the 1976 edition for its fine colour, and that of 1995 for the pleasure of seeing actual letters and envelopes in good colour. Of course (!) everyone should have J.R.R. Tolkien: Artist and Illustrator, and not just because of its good ‘Father Christmas’ reproductions. Image: Left to right, the upper covers of the 2009 trade paperback and the 2012 hardback editions of Letters from Father Christmas. For other covers, see TolkienBooks.net. * In Chronology we mistakenly wrote that the first page of the 1933 letter appeared only in the 1976 edition. We have added this to the next group of addenda and corrigenda to be posted to our website. Thank you very much for this incredibly informative post. For completeness’ sake, I think I can add one more item to your list of previously published items not included in the 2012 edition. As far as I have been able to determine, the note “Love from Father Christmas / 1926” published on p. 11 of the 1976 edition, which you say in the Guide (p. 829) is from the verso of the 1926 drawing, has not been included (though a very similar note can be found at the end of the letter for the same year, reproduced on p. 26). It is wonderful to have so many of the actual letters reproduced (even if the reproductions are rather small). Are you at liberty to provide us with a rough indication of the amount of material that still remains unpublished at this moment? Sorry to take so long to reply. Your comment arrived just as we left to take part in the Miami Book Fair International (blog post forthcoming). You are right that another omission from the 2012 edition is the inscription from the verso of the 1926 drawing. A more complete inscription than that reproduced in the 1976 edition is transcribed in Catalogue of an Exhibition of Drawings by J.R.R. Tolkien at the Ashmolean Museum, Oxford (1975): ‘Love from Father Christmas / 1926 / drawn by Fr. C / AND ME / NPB’. The same catalogue notes some other inscriptions on versos: ‘Drawn by Fr. Xtmas / 1927’ on the verso of the 1927 picture, and ‘Love from / Fr. Christmas / 1933’ on the verso of the 1933 picture. There are a few other, similar verso inscriptions on items not included in the exhibition, and possibly more envelope versos with seals. Otherwise, only a few minor items have not yet been published: a couple of plainer envelopes, mainly for replies to pre-Christmas letters, and a couple of brief notes.